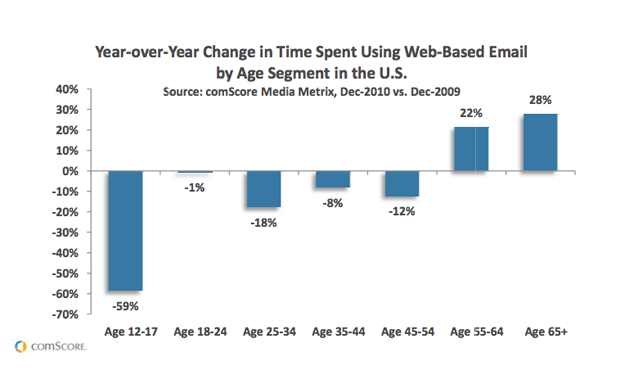 ComScore Says You Don't Got Mail: Web Email Usage Declines, 59% Among Teens! 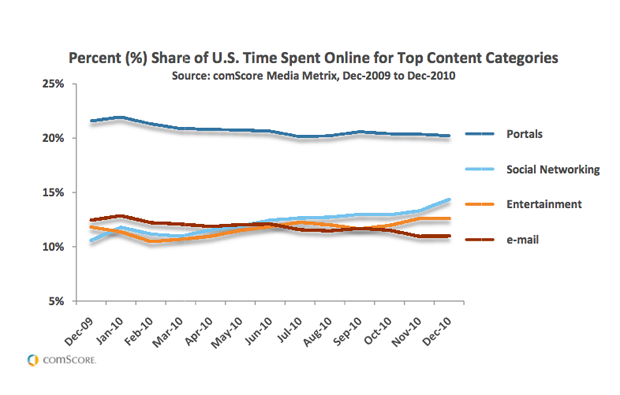 A comScore report on 2010 digital trends reinforces at least part of Zuckerberg’s claim. It’s inevitable: Innovative social messaging platforms like Facebook and Twitter as well mobile communications continue to dominate our online time, and web email begins its steady decline. Total web email usage was down 8% in the past year (YOY), with a whopping 59% decline in use among people between the ages of 12-17. Cue Matt Drudge -style alarm. Usage was also down 1% among 18-24 year olds, 18% among 25-35 year olds, 8% among 35-44 year olds and 12% among the 45-54 demographic. Because oldsters are continuing to migrate online in droves, web email use actually saw an uptick in the AARP-eligible sector, with 22% gains among 55-64 year olds and 28% among those 65 and older. Obviously this was not enough to offset the decline in youth usage. Young people are simply spending more time social networking than anything else, up 3.8% to 14.% of all time spent online. In contrast, use of web -based email lost 1.5% at a total of 11% of time spent. Yahoos and Aols of the world, you might have a problem if people in their mid-twenties aren’t using your product, especially if Zuck is going after them young. Granted Facebook Messages is far from flawless, but it’s a start.